The shopping festival in Dubai is quite well-known; but what do your little ones do when you are indulging in some serious retail therapy? You will be surprised to know that there are quite a few places which can keep your kids entertained. This 1.5 million square feet of temperature-controlled indoor theme park (think of 28 football fields), has finally opened its doors on August 15. Children can now come and happily explorethe Marvel Area (with Thor, Iron Man and the like), the Cartoon Network zone (there will be a Powerpuff Girls ride, of course) and a Lost Valley dinosaur-themed section. It’s absolutely cool to enjoy a swim with the dolphins at the very sophisticated Dolphin Bay in The Atlantis. There is a range of dolphin experiences suitable for all ages and these include standing in shallow water to swimming or scuba diving along with these beautiful marine creatures. Dune bashing is a local term used for going on the dunes and having some fun. If your kids enjoy being outdoors, then it’s a good idea to plan a desert safari. 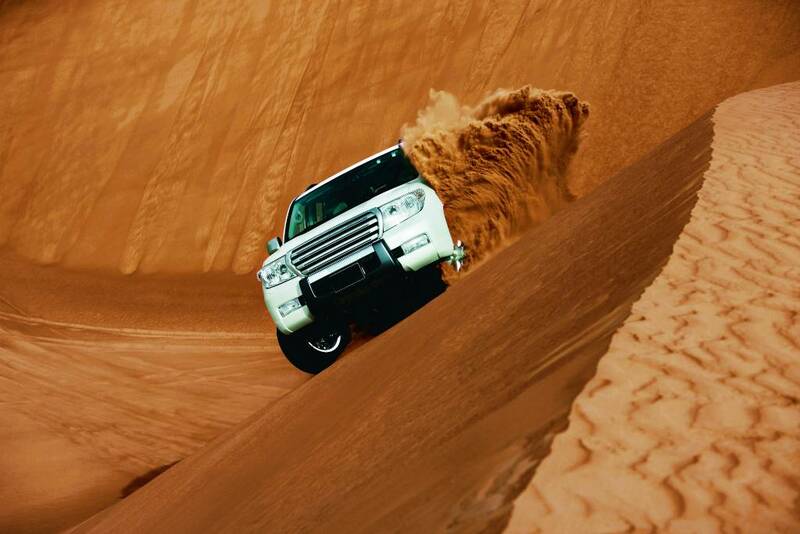 The safari usually includes a guided tour of the dunes in an SUV. You may also indulge in sand boarding and riding quad bikes. Kids love to play in the sun and the desert might just be the best place to bond with your kids. From the dry sand dunes to the wet Wild Wadi — this theme park is located next to theJumeirah Beach Hotel and has a number of interesting slides, rides and surfing options. You can bring your own swim suit, and this place is perfect for lovely wet get-together! As the name suggests, this entire place is designed for children’s amusement only. Located at Dubai Creek Park, the entire span of 80,000 square feet area is meant for children from 2 to 15. It has been designed scientifically, so that children have a perfect blend of entertainment with education. The elements of nature, science, space and human body is mixed with activities, so that children can learn something while they have fun! The flight simulator is perhaps the best attraction of this place. A family travel in Dubai can create a lot of happy memories; the place can be quite exciting and amazing with its plethora of activities. From an ice rink to tennis court; from bowling alley to swimming pool; there are quite a few options which will keep you children busy. Children can try their hand at different games, or they can simply visit the amusement park, ride the rollercoaster or indulge in go-karting. Positioned on Umm Hurair Road, this place is bound to impress children and young adults.